Long before the Mint began production in 1793, officials were well aware of the need to maintain the integrity of American coinage. The nation’s coins were its face to the world—they not only needed to be of correct weight, but it was equally important that they appeared solid and trustworthy. The necessity for particular care in the preparation of gold and silver planchets was a given, but it was attention to design where the Mint initially came up short. Public criticism of the first issues made officials acutely sensitive to ridicule. No one wanted another fiasco like the Chain cent, where the interlocking links were misinterpreted by the public as the chains of slavery. The Mint could ill afford anything less than perfection in either weight or design. Design is largely a matter of opinion, but the precious metal content of a nation’s coins is an entirely different matter: There is no room for error or even the slightest impropriety. So serious was Congress in this regard that the Coinage Act of 1792 required $10,000 personal bonds for each of the Mint officers holding a fiscally responsible position—before gold and silver coins could be minted. The Chief Coiner and Assayer, entrusted with overseeing supplies of bullion and coins on hand, were unable to raise such a staggering sum, precluding coinage of the larger denominations in 1793. At the urging of Secretary of State Thomas Jefferson and President George Washington, Congress relented in early 1794, lowering the bond requirements to more reasonable levels. The bonds were posted, and silver coins, starting with the half dollar and dollar, began to appear in the Fall, gold coins would have to wait until the following year. In June of 1795, Henry DeSaussure replaced David Rittenhouse as Mint Director. His initial goals were to begin striking gold coins and improve the current coin designs. Under Rittenhouse’s orders, Chief Engraver Robert Scot had already prepared dies, and on July 31, 1795, 744 half eagles were delivered: the very first gold coins produced by the United States Mint. 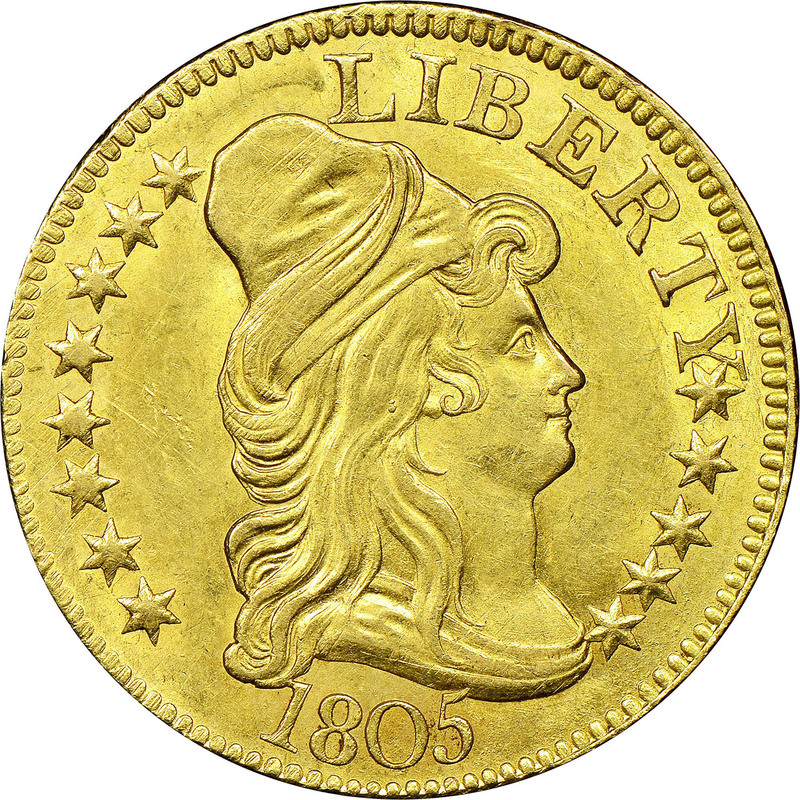 Scot’s depiction of Liberty on the new coins was a Classical design, modeled after a Roman-style Hellenistic Greek goddess, with hair rearranged and a large cap. The bust was draped so as not to offend “modern” eyes of the late 18th-century with the easy sensuality of the ancient motif. An onyx cameo from first century Rome inspired the reverse, which bears an eagle with wings outspread, holding a wreath in its beak and a palm branch in its claws. The small and stylized eagle was often called a “chicken eagle” by early citizens, a name sometimes heard in the numismatic community of today. Along with the date, only the inscriptions LIBERTY and UNITED STATES OF AMERICA are found on the coin: no denomination or statement of value appears. Only 18,512 Draped Bust/Small Eagle fives were produced from 1795 through 1798, and most didn’t escape the huge melts that later destroyed the bulk of U.S. gold coinage minted before 1834. Survivors, particularly in high grade, are very scarce. By far, the most common date of the series is 1795: With 8,707 minted and many saved as first year of issue “souvenirs,” this is the date seen most often in type sets. It is generally found with bright, prooflike fields, and often with lint marks—vestiges of lint from the soft cloths used to frequently wipe and polish the dies. Choice mint-state specimens exist but are very rare. Even the seven examples of this date in the famed “Eliasberg Sale” only ranged from XF to AU. An interesting error of this year is the S over D variety, a blunder created when the word STATED was first punched into the reverse die and then corrected by overpunching the D with an S.
All coins from 1796 are overdates—1796/5—and are considerably more difficult to locate than the first year issues. Very few exist in mint-state. 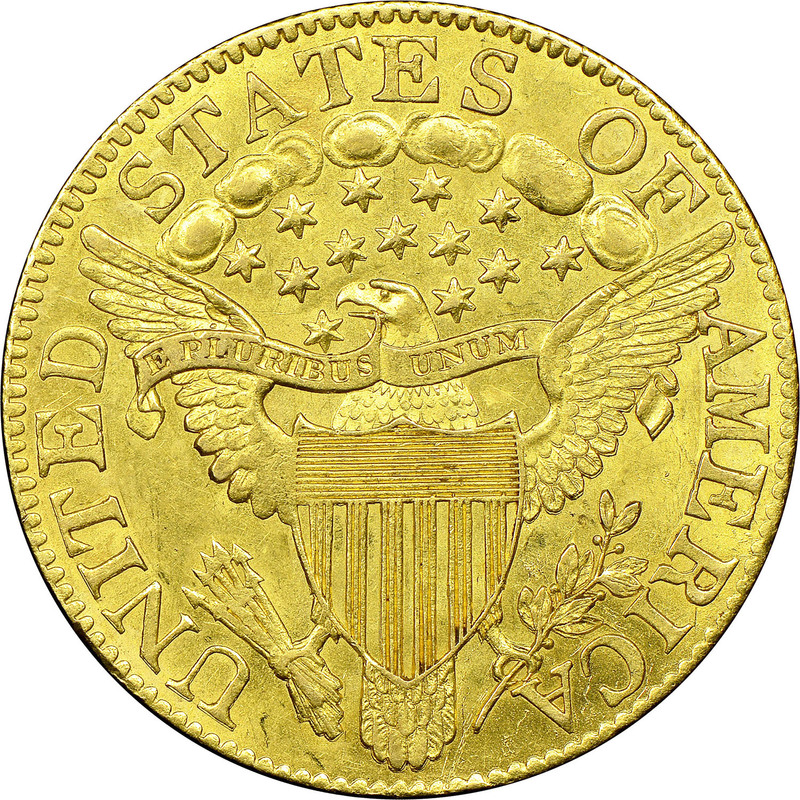 Half eagles struck in 1797 are of two types: either 15 or 16 stars are on the obverse. Both are rare, with the 15-star variety somewhat more elusive. The 16th star was added after Tennessee’s admission to the Union. The 1798 issue is the key of the series and, with only seven traceable specimens, is one of the rarest half eagles of any date and the coin that prevents collectors from attempting complete “date” sets of this design. This issue was unknown until 1865, when W. Elliot Woodward discovered the first specimen. Mint records are vague on when these last Small Eagle fives might have been struck, but numismatists believe they were either the first 691 pieces produced in 1798 or part of an emergency issue of half eagles struck in December 1797, after the yellow fever epidemic of that summer. In the rush to resume production, any available dies were pressed into service. Researchers believe a similar epidemic and mint closing the following year were responsible for the enigmatic 1795-dated Heraldic Eagle fives. In this era the Mint commonly used all dies until they were no longer serviceable. Obverse and reverse dies were used haphazardly in different years and in different combinations, accounting for many unusual and out of sequence die-pairings so often seen on early coins. Early fives, along with large cents, were among the first issues collected as the hobby took root in the mid-to-late 19th-century. Later, as numismatic scholarship advanced, some collectors such as John Clapp and Walter Breen turned their attention to die varieties. Today only a few dedicated specialists still form collections based on these variations. The vast majority of collectors pursue these coins for type sets. When grading this design, obverse wear first shows on Liberty’s hair, cheek, shoulder and cap. On the reverse, check the eagle’s wings, breast and left leg. Frequently seen on these early fives are adjustment marks, parallel lines made by files used in adjusting overweight planchets. These lines generally survived the striking process and, while adjustment marks may not affect a coin’s technical grade, they do influence its value. Counterfeits are usually not encountered of this series, but altered dates do exist, simulating the rare 1798 issue. The Small Eagle series of half eagles ended early in 1798. Scot’s Heraldic Eagle design for the reverse—adapted from the Great Seal of the United States—appeared on the later issues of that year and continued through 1807. Made for more years and in larger quantities, the Heraldic Eagle type is found much more regularly than its predecessor. Rarely is a Small Eagle five seen on a bourse floor; usually only major auctions offer a specimen. Its simple, yet elegant, design, coupled with its status as the first type of half eagle, makes the Small Eagle five truly an American classic. Scot set out to appease the critics and improve the design, and his resulting Heraldic eagle reverse motif was based on the bird gracing the Great Seal of the United States. This design is called Heraldic because it is the stylized supporter of the nation’s shield, much as the lion and unicorn support the British coat of arms. Scot’s version combined a chicken-like head with a body wide enough to hold the thirteen-stripe shield. The upraised wings are thin, partly covered by a flowing scroll inscribed E PLURIBUS UNUM. Clouds overhead frame thirteen to sixteen stars—symbolizing the original states and three new ones formed after independence. Scot blundered in one respect, however, apparently forgetting that directions are reversed in heraldry, which regards the eagle as if it were a person facing the viewer. The eagle’s right or “dexter” side is therefore the viewer’s left or “sinister” side. 13 arrows are in the eagle’s right claw, an omen of war. This oddity continued until the series ended in 1807. Comprising only 10 dates, the series is rich in history and rarity and includes three early dates long steeped in mystery. Although Scot did not cut the Heraldic eagle reverse dies until early in 1798, strangely enough it exists with obverses dated 1795, 1796/5 and 1797. The first 1798 dies used with the Heraldic reverse had a large 8 in the date and thirteen reverse stars. The shield bears six “red” stripes composed of five lines each. This system of showing color by raised engraver’s lines was a code created by 16th century engravers to show colors in elaborate coats of arms that could only be printed in black and white. The next dies showed a large date with shield stripes made up of three raised lines each. Above were fourteen stars, soon revised to only 13 at the order of the third Mint Director, Elias Boudinot. These stars are found in either an arc or a cross pattern. Small date 1798 coins finish the year’s mintage, which totaled only 24,867 of all varieties. Only 7,451 coins were reported for 1799, including pieces with a large final 9 and either large or small stars; and a large recut 9 with stars large or small. Coinage of 1800 comprised 37,628 pieces, but many of these are believed to have been dated 1799, while additional coins were struck during 1801 with still other dates. The steel-starved Mint used any available dies for as long as they were serviceable. Although 1801 dies were prepared, no coins were struck from them. This date exists only in ghostly form as the next year’s 1802 over 1 overdate! All 1803 coins are also overdates, properly called 1803/2. The 1804 half eagles are known with small 8 and small over large 8, the latter very rare in mint state. Coins of 1806 occur with either pointed-top or knob-top 6. The last date is 1807, known in three major varieties. The first shows a small date with small obverse and reverse stars; the second displays small date and large obverse and reverse stars. The last variety is the large date with large obverse and reverse stars. What then of the Heraldic eagle coins bearing the dates 1795, 1797 and 1797/5? To understand these enigmatic issues, it is necessary to recall the annual epidemics of yellow fever that prostrated Philadelphia in the late summer and early autumn months. At the end of the 18th century, Philadelphia was still the second largest city in the English-speaking world, largely recovered from the destruction of the Revolutionary War and the British occupation, but helpless against mosquito-borne epidemic disease. Yellow fever drove the wealthy into the countryside, while the poorer classes grimly awaited the scythe of fever to sweep the city. These annual outbreaks wreaked havoc with the Mint’s production. When the second mint director, Henry William DeSaussure, stopped half eagle coinage in September, 1795 to concentrate on eagles, the still usable 1795 half eagle dies were stored away, one of these redated as 1796/5. After the 1796 yellow fever epidemic, a 1797 die was created and used with the proper Small Eagle reverse. In the frantic scurrying of the 1797 fever, all these dies were locked away in the strong room of the Bank of the United States while the Mint closed down completely. After the Mint resumed operations in the early months of 1798, sudden demand for half eagles led to the muling of these older dies with Scot’s new Heraldic Eagle reverses. The new reverses were pressed into service with the now lightly rusted 1795, 1797/5 and 1797 obverses to create the mysterious “combination” coins that are so rare today. Perhaps as many as 316,867 Heraldic Eagle $5 gold pieces were struck at the Philadelphia Mint between 1798 and 1807, though the lack of precision in early Mint records makes this total an estimate rather than a concrete fact. No proofs exist, though the softness and ductility of gold coupled with Mint attention to detail did create some extraordinary “presentation” coins of uncertain purpose. Gold coins from this period were all but ignored by early collectors. The late Walter Breen first examined this denomination’s die varieties in his pioneer “Early U.S. Half Eagles,” published in The Numismatic Scrapbook Magazine in 1966. Collectors today primarily pursue only one example of this design for “type,” as few can afford to assemble either complete date, or date and variety collections. All dates are scarce to extremely rare in any grade. The 1797 with 16 star reverse is unique and is now part of the Lilly Collection in the Smithsonian, forever off the market. Along with the remaining two “backdated” coins, other rare issues are those of 1798 and 1799. The 1806 is the most “common,” particularly in high grade. Uneven strike sometimes resulted in weakness at the centers of this design, and actual wear may first appear on the locks behind the ear or on the forehead, eagle’s outer wings and on the clouds, rather than at the ear or shield. In 1807, the new mint director, Robert Patterson, appointed German engraver John Reich as assistant to Scot. Reich’s first assignment was to improve the coinage designs. Six months after his arrival, the new half eagles appeared, this time with a capped bust of Liberty facing left, and a new reverse with a more natural and peaceful looking eagle.